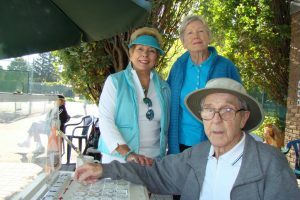 Do you have some mornings free and want to meet and socialize with new tennis friends? Then Don Mills Kaffeeklatsch is the place for you! 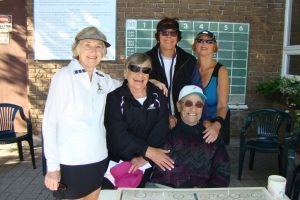 Kaffeeklatsch is an adult, organized social doubles program that meets every Tuesday and Friday morning from 8:30 a.m. to 12:00 p.m. on all 6 courts (8:00 a.m. to 12:30 p.m and 4 courts during July and August while the Junior Tennis Camp is in progress). It’s a great way to work on your game and keep fit in a relaxed social atmosphere. However, you do need a basic level of skill and knowledge of the game. Kaffeeklatsch is a drop-in program so, feel free to come when you like and leave when you have had enough tennis! Some keen members come as early as 8:00 a.m. and arrange their own games. Others stay after noon for another match. It’s your choice. Personally I like to get there early, play a few matches and I still have the rest of the day for other activities. 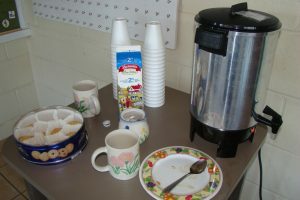 Coffee is on tap all morning, provided by the Club, and often participants bring cookies or other treats to share. A monitor is on hand to organize matches and pair up participants appropriately. Matches are doubles only and consist of 8 games, tennis balls are provided and we even have an air-conditioned club house for those hot sticky days. Players mix-up and rotate after each match so you get to play with a variety of players. Everyone is super friendly and will quickly make you “feel at home”. If you are new to the club this is a great place to find people at your level of tennis. You can then go on to arrange court time on other days with them. Be part of the group, we are always on the lookout for new people (and new monitors, if you are so inclined!). 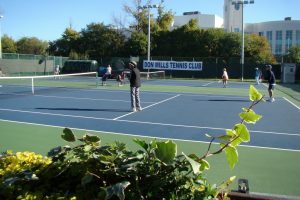 … I moved to Don Mills in 2014, joined the tennis club that summer and have enjoyed playing with the Tuesday and Friday morning group since then. Without a doubt this club is the friendliest, most inclusive group I have ever belonged to. … Most of us are retired or semi-retired so playing within your age group is so much more enjoyable. Total acceptance, regardless of your level of play, is guaranteed. We are all there to have fun playing as well as getting some fresh air and exercise. To top things off, relaxing and socializing between matches is fun too. You can be sure I`ll be there every opportunity I have!